Westhill's Morgan Kurtz slides safely into home beating the tag of Darien catcher Rebecca DeMaio during their game at Darien High School on Monday, April 8, 2013. Westhill beat Darien, 11-9. STAMFORD -- You know that long-held adage about pitching and defense winning games? Based on the first week of the FCIAC softball season, you can throw it out the window. This year, it's hitting and defense. And no one realizes the seismic change thus far more than Westhill coach Tom Pia. In games against Lauralton Hall on Friday and at Darien on Monday afternoon, the Vikings gave up 19 runs, yet won both times, taking an 11-9 slugfest against the Blue Wave. "This is what it has turned into," said Pia, after his team took, relinquished and then regained a lead for the second time in four days. "Give up almost 20 runs in two games. I remember when we didn't give up 20 in a year. Darien hit the ball and we hit the ball. The good thing is we came back again." Earned run averages by the end of the season may more closely resemble the national debt, though they are being offset by sloppy early-season defense. In a rematch of last year's FCIAC championship game, won by the Blue Wave, each team committed three errors, and Darien held a 14-12 edge in hits, but the Vikings were able to bunch them in a more timely manner. "We were all at Stamford High School every week during the winter hitting in the batting cages and putting in work," said Megan D'Alessandro, who finished with three hits and two RBIs against Darien. "We knew we had a tough opening schedule. Being 3-1 right now is really great." Erica Gambino added three hits and drove in four runs for Westhill, while Tammy Wise went 2-for-2 and reached base four times. Adriana Gambino drove in two runs. "It used to be when you got three runs you weren't focusing on hitting, you focused on defense and what the other batter did the previous time up," Pia said. "Now you focus on hitting the ball." After the Blue Wave (1-2) scored four times in the second inning for a 5-4 lead, the Vikings came back with three runs in the fourth inning, all with two outs. 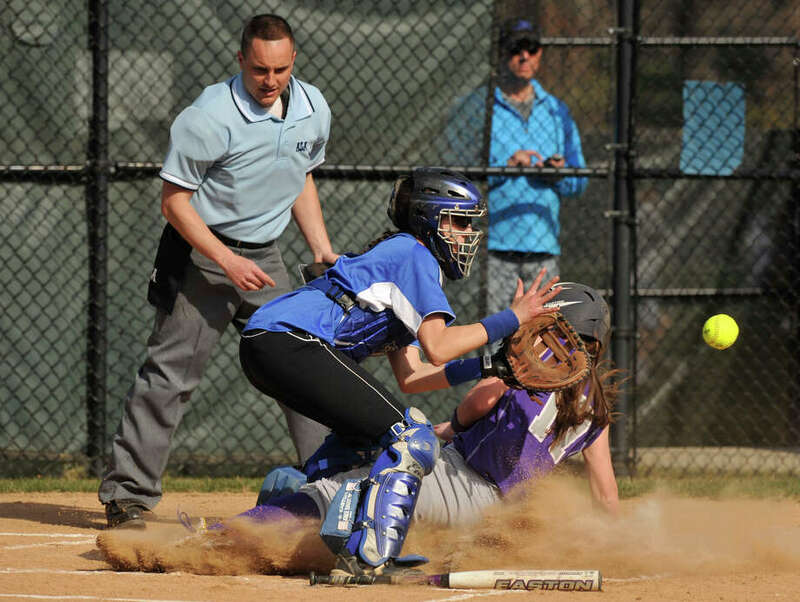 Wise, D'Alessandro, Kate Brainard and Adriana Gambino each singled, while Westhill also took advantage of an error. Darien chipped away and tied the score at 7-7 in the 5th when Emma Hamilton, who had three hits and two RBIs, hit a leadoff triple and scored on Brittany Osborn's second run-scoring single of the game. But Westhill scored twice in the 6th on an error and wild pitch and twice in the 7th on RBI singles by D'Alessandro and Erica Gambino. "We have a good hitting team," Pia said. "They have a lot of confidence, which is really good. I have confidence that anyone in our lineup can get a hit when we need one." Darien, along with St. Joseph considered a preseason favorite, is still trying to find some traction after losing most of the nucleus of last year's team. Darien's Kelly Vodola had a triple, inside-the-park home run against a defensive shift and 2 RBIs, while Avery Maley and Emily Moscatello had 2 hits apiece, and Erika Osherow 2 RBIs. "We're trying to get our legs under us and find kids who can make some plays," Darien coach Nick DeMaio said. "The thing with Westhill is the year changes and the players change but they play the same brand of softball. We battled back and battled back, but in the end we gave away too much." The Blue Wave can take solace that they were 2-2 at this point last season, and both losses again were to Masuk and Darien. Osherow, a sophomore making the transition from shortstop to pitcher, has good velocity and, said DeMaio, just needs seasoning. "She's definitely able to shut down anybody," DeMaio said. "The one thing she didn't do today was get ahead of anybody. She just needs to find a groove, find a rhythm." The Vikings also have had to account for lost starters, but thus far have found a way to compensate. "One through nine we've got a bunch of hitters," D'Alessandro said. "It's not just one person." Based on the early returns, that formula may be enough this season. Records: Westhill 3-1; Darien 1-2; Batteries: W--Sadie Apfel, Kelly Tanacea (5, W, 2-0) and Brittany Bautista. D--Erika Osherow (L, 1-2) and Rebecca DeMaio. ; Doubles: W--Morgan Kurtz, Bautista. Triples: W--D'Alessandro, Erica Gambino; D--Emma Hamilton, Kelly Vodola. Home runs: W--Vodola.